In his more than 40 years of working with people to help them discover their truest selves, Dale has evolved a number of techniques for inspiring transformation. Some are done individually, quietly, and some are done with others, with energy. All enable us to set aside the critical, fearful mind and to move towards openness and wholeness. Relationship Transformers: Ten tools to help create healing relationships. 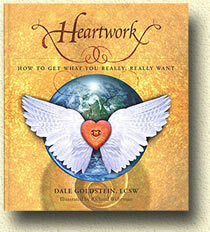 Relationship as an Opportunity for Personal and Spiritual Growth: An article by Dale on the journey of relationship. 5 Day Online Forgiveness Retreat: The most powerful residential Heartwork retreat ever offered made available online. One Year to Live: How would your life change if you had one year to live? Music: Music is used throughout Heartwork events to promote wholeness in a number of ways. Books: Books on meditation, psychological approaches, personal growth, relationship, and more. Dances: Local opportunities for ecstatic dancing to open the heart. It’s also helpful to realize that this very body that we have, that’s sitting right here right now… with its aches and its pleasures… is exactly what we need to be fully human, fully awake, fully alive.